I'm attempting to write out C# string data to a UTF-8 file without a byte order mark (BOM), but am getting an ANSI file created. According to the documentation for the UTF8Encoding class constructor, setting the encoderShouldEmitUTF8Identifier parameter to false should inhibit the Byte Order Mark. I'm using .NET Framework 4.5 on my British (en-gb) computer. 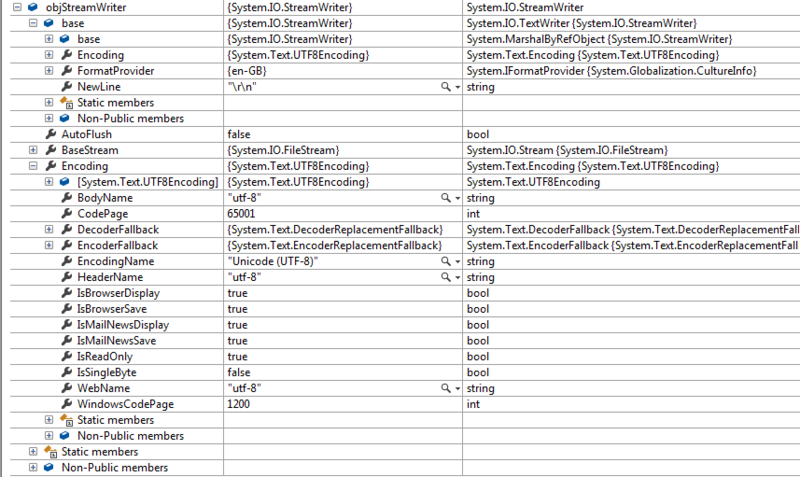 Below is screenshot of the ScreenWriter object showing UTF8Encoding in place. So why am I getting an ANSI file (as checked with Notepad++) back from this operation? Your example string that you're writing to the file consists only of characters in the ASCII range. The ASCII range is shared by ASCII, UTF-8 and most (all?) ANSI code pages. So, given that there is no BOM, Notepad++ has no indication if UTF-8 or ANSI is meant, and apparently defaults to ANSI.